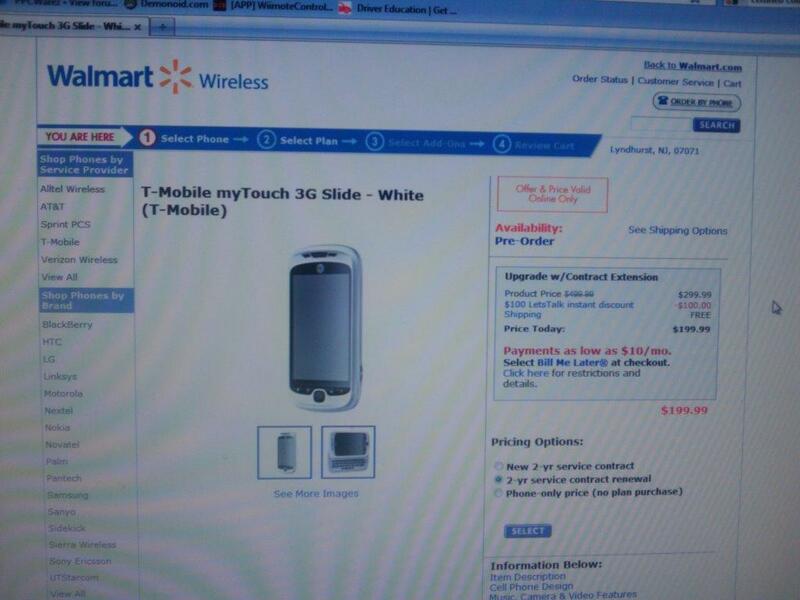 You are here: Home > Pre-Order Your myTouch Slide At Walmart? While you will not be able to get your hands onto the myTouch slide until June 2nd, those fine folks at Walmart are you giving you the chance to pre-order. We should mention we didn’t actually go through the sales process but we’re hoping this “pre-order” will ship in time for a June 2nd arrival. Otherwise, well the pre-order becomes a silly idea. It’s unusual T-Mobile itself hasn’t done a pre-order for this device considering their high-profile myTouch launched back in August of last year with a pre-order. On the other hand, the Walmart pricing is $20 more than the T-Mobile price of $179.99 after rebate. If you absolutely positively hate the idea of a rebate, perhaps Walmart is right up your alley. Of course, if you do not want a pre-order, you can always stop by Best Buy and donate a kidney (maybe a liver) to purchase the myTouch Slide outright at $549.99. Let us hope the new customer/upgrade price is a significantly reduced number. ← T-Mobile Garminfone Launching June 2nd? i’d rather pay full price from tmobile for 399.99. best buy is ridiculous. Is $399 the confirmed full price? Yeah, no way would anyone knowingly pay Best Buy more than the price of a Nexus One for a MyTouch Slide. Best buy? No way! I just played with this phone at work (tmo care rep) and all I can say is… Damn it’s fast!! Just as fast as my Nexus 1….blew me away what it can do! Whaaat.?! Since When Does Best Buy Sell T-Mobile Devices.? They have since last year or 2 I do believe. They don’t sell contract t-mobile they only sell subsidized though. If you switch the pricing to “phone only” the price jumps to $499, let’s hope the price from T-Mobile isn’t that high. Walmart.com says $129.99 when I click on it. So TMO is expected to sell this $179 after MIR for new 2 yr contract. Choosing new contract on Walmart the price is $129 after instant discount. Too bad Tmobile customer can’t doesn’t match online prices. I am not eligible to get my upgrade yet however they made a note on my account where I can upgrade early and get it at the full discounted price which should be $179. Hopefully they will at least waive the upgrade fee. I’m confused. I have a TP2 right now that I’m not too fond of (and I’ve been a Windows Mobile buff since the MDA days). I’m thinking about buying the MT3G Slide to hold me down until the new super slider phone (Project Emerald?) is going to be released. The street price for a kidney in a black market is $1000. You would actually net some cash after getting the phone. Funny…. I work in a WalMart Connection Center and this phone is no where to be found on my kiosk. I wonder if its something only available in certain areas? Doesn’t make sense… then again not showing up in my computer doesn’t make any sense neither. 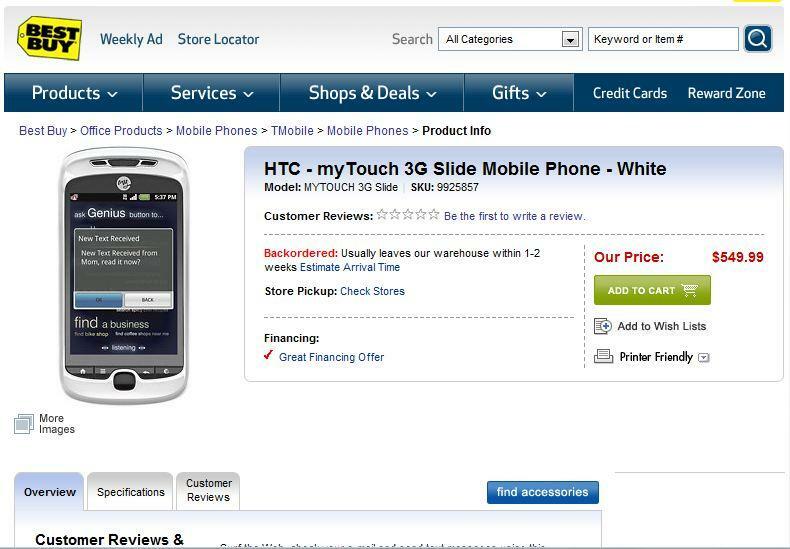 Actually the mobile phone piece of Walmart.com is operated by internet dealer- let’stalk.com or something- not by Walmart – might be the reason you don’t see this..